Did you know the average American household throws away about 25% of their food? If we all made an effort to compost leftovers, landfill loads would significantly decrease. In addition to this benefit composting is great for all gardens! Not only does it improve garden soil and help to keep plants healthy, it helps to reduce harmful greenhouse gases. “Organics that break down in a landfill produce methane gas, which is about 120 times more harmful than carbon dioxide,” says Cary Oshins, assistant director for programs at the United States Composting Council. So why not help the planet and your yard by piling up your leftovers? Getting started doesn’t necessarily require any special equipment: piling up materials and letting nature take its course will eventually produce compost. Starting can seem like a very daunting task to a beginner with all of the talk of Ph balances, microbes and smells, but it’s a lot less scary than it seems. I’ve done the heavy work for you and put all that you need to know into a simplified list. Check it out below. Although it may resemble it finished compost is not soil or fertilizer. It is a soil enhancement that can be incorporated to help the soil retain moisture and nutrients. It also helps to improve the texture of problem soils and encourages the growth of microorganisms that help to maintain plant and soil health. Best of all though: it’s a free and easy way to dispose of organic waste, which will ultimately decrease landfill usage. Choose a bottomless container (plastic, metal, or wood) and place it in the ground in a partially shaded area of your yard. It is necessary that the bin be bottomless to allow for proper drainage. You can purchase containers that are specifically made for composting, but any container will do. It is important to place your compost bin in a partially shaded area. In full sun the bin can create excessive heat build up, while full shade will cool the bin too much in the spring and fall. Fruit and vegetable peels, coffee grounds (and the paper filters) eggshells, grass clippings and leftover fruits and vegetables. You can place any and all organic matter into your compost bin, but the majority of the bin should be made up of dry materials such as twigs, dead leaves, newspaper, and paper. These items contain carbon which provides the microbes that decompose the pile. Food and other moisture rich items supply the protein that microbes need to reproduce. Avoid putting meats, cheese, cooking oils, or fish because they will attract animals. You’re likely to get the best results if your compost pile is a three-to-one ratio of dry to wet. Compost is very forgiving so no worries if it isn’t perfect. The great thing about creating a compost pile is that once you make one, the upkeep is very mild. It’s most important to keep an eye on the moisture level. The pile should be damp but not soaking wet or dry enough to blow around. It’s recommended (but not necessary) to turn your compost every two weeks to aerate your pile. This will also allow for faster results. Ordinary composting does not smell. If a compost pile smells, something is wrong and it’s usually simple to diagnose. The microbes responsible for breaking down your compost pile need a balanced diet of nitrogen and carbon. 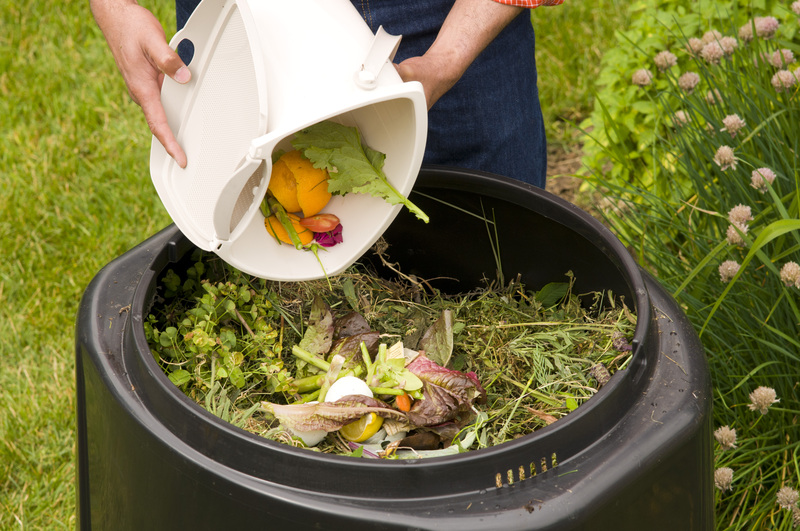 Nitrogen comes from green materials such as food scraps and grass clippings. Carbon comes from brown materials such as dead leaves and newspaper. A ratio that contains equal portions by weight (not volume) of both works best and will reduce smells. Only two sorts of smells usually affect a pile: rotten smells and ammonia. A compost pile that smells like it’s rotting has gone anaerobic. This means that there is not enough oxygen to support aerobic microbes and the anaerobic ones have taken over. Unfortunately, they produce hydrogen sulfide which smells like rotten eggs. The solution is simple: turn the pile. You can also add large sticks in the center to help air flow. When a compost pile smells like ammonia, it is giving off excess nitrogen in the form of ammonia. This problem occurs most often if high-nitrogen products have been added. The short-term solution is to turn the pile to help the excess ammonia to vaporize. Mixing in brown material can also restore the carbon-nitrogen balance. To fix this issue long-term, add less nitrogen filled products. 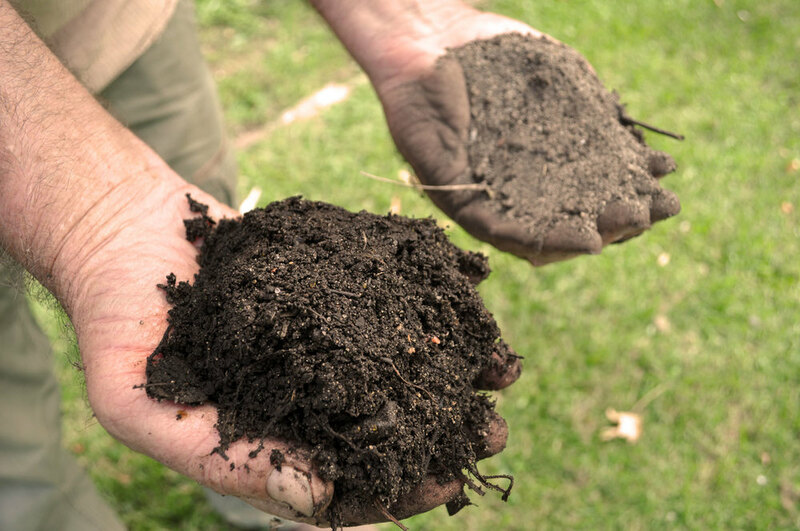 It usually takes four to six months for compost to turn into dark brown or black soil with a nice earthy aroma. Once the majority of your pile fits this description take away the bin and let the finished pile continue to break down in your yard for a few weeks. Place the bin in a new spot to begin a new pile. Start It off by removing any pieces from your previous pile that aren’t quite decomposed and adding those. If adding ashes to your pile, add them sparingly as they are alkaline and can affect the pH of the pile. During the winter keep your compost pile in a black plastic bin and in direct sunlight to continue the composting process. Hay bales can be used to further insulate the pile. Place a lidded container in your kitchen where you can place compostable items; similar to the idea of a trashcan. Get into the habit of tossing all compostable items in this container and dispensing them once a day or every other day. Rub a Dub Dub… Got Pups in Your Tub?